Putney & Wimbledon Brass Band is an independent community-focused band in the heart of South West London. Our aim to be an asset to local brass players and the communities in and around Putney and Wimbledon, bringing quality brass band music to the boroughs of Wandsworth and Merton. We’re a fully-functioning band of close to thirty players, made up of locals ranging in age, background and experience. It’s safe to say we’re a fun and sociable bunch too; we have a very active social scene and organise regular events, trips and informal get-togethers. The band rehearse in Putney every Wednesday from 7.45pm-10pm, and can usually be found enjoying a drink or two in a local pub afterwards. We have also developed strong links with local organisations. This includes local business organisations such as LoveWimbledon, Positively Putney and the Wimbledon Village Business Association and have played at events with the invitation of Wandsworth and Merton Councils. Additionally, we have played at the lovely South Park Gardens with the invitation of Friends of SPG, as well as performing with fellow local group Wimbledon Community Chorus. To see a list of our upcoming and previous events, take a look at our events page. Sam’s banding career started at the tender age of 3 with a tour to France with the Wilton and District Band. His Dad was the principal cornet player and Sam appeared to enjoy the music with some inventive dancing and particularly enjoyed the visit to the cognac distillery (some things never change). As soon as Sam had enough teeth, his Dad taught him to play the cornet. He progressed through the learner’s band and was invited to join the senior band, taking part in numerous concerts, contests and tours. In 2008, Sam saw the light and switched from cornet to baritone; the great harmonies were an immediate hit! Some of Sam’s most memorable moments include playing with Wilton and District at the National Finals in 2012 and 2013, along with starting a Mexican wave in the hall just before the results were announced. His memories of the occasion beyond this point are a bit hazy. In 2012, Sam moved to London to study medicine at Imperial College. 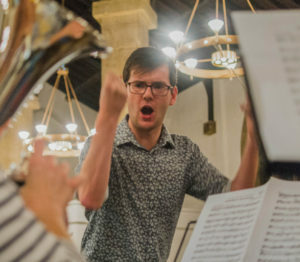 Sam started conducting in 2013 and is inspired by conductors he has played under including Dennis Chalk and Derek Broadbent. He enjoys a ‘juicy quaver’ and talking about style (thanks for the speech, Derek). A very keen brass band fan, Sam can often be seen enjoying the finest bands playing at the British Open, National and European Championships.